Bill Steeves (left) and Steve Broda launched Skyline Roof Restoration, a company that specializes in restoring roofs with coatings. Rehabilitation facilities help their patients stay healthy. Keeping roofs healthy is another matter. 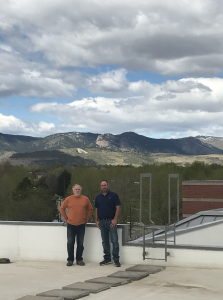 When the roof at a rehabilitation center in Colorado was reaching the end of its service life, roofing contractor Bill Steeves recognized it was the perfect candidate for roof restoration project. Steeves is the president of Skyline Roof Restoration Inc., based in Frederick, Colo. The company specializes in roof coatings. It was launched last year by Steeves and his partner, Steve Broda. Broda is the founder of Skyline Roofing Inc., a full-service commercial roof contracting firm, also located in Frederick, where both men have worked since 2006. In many cases, coating an existing membrane roof can be an excellent option. “It can save the customers a lot of money compared to a roof replacement, and depending on the system and the thickness, we can offer a 20-year NDL warranty,” Broda notes. The Centre Avenue Health & Rehab project encompassed 21,863 square feet of low-slope roof on 10 separate roof levels. The low-slope sections were surrounded by a standing seam metal roof. 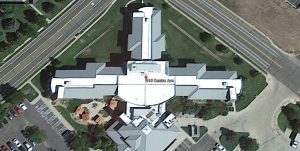 This aerial photo shows the Centre Avenue Heath & Rehab roof after the restoration process was completed. Steeves suggested it was time to conduct a roof inspection at Centre Avenue but was told to wait. Sure enough, the next time it rained, a leak was detected. 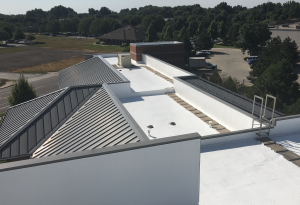 When Steeves met his repair crew on the site, he noticed that the fully adhered EPDM roof system on the flat roof sections was just beginning to exhibit signs of oxidation. A few stress fractures were visible in the membrane. “It was a perfect candidate for a roof restoration,” he says. When Steeves detailed the costs involved with the coating project as opposed to a tear-off and replacement, the owner gave him the go ahead on the roof restoration plan and opted for a 15-year NDL warranty. Every proposal is also contingent on a successful adhesion test. A sample area is set up and a pullout test is conducted to determine if the product will adhere well. Photos: Skyline Roof Restoration Inc.